Miss Millane, 22, disappeared in Auckland on 1 December - police ended their search on Sunday after finding a body in the outskirts of the city. The judge acknowledged Miss Millane's family's grief "must be desperate". 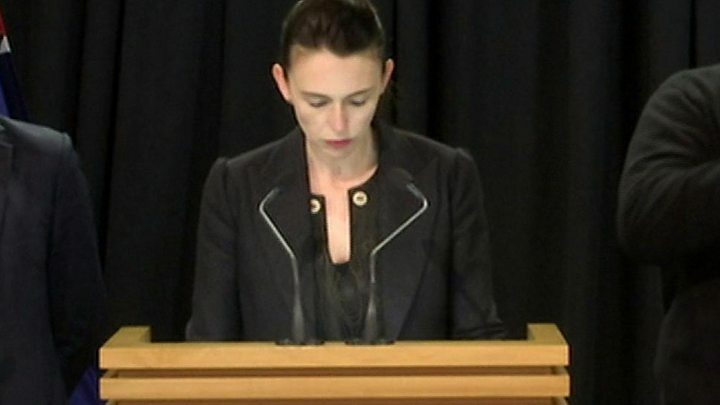 At a news conference, the New Zealand Prime Minister Jacinda Ardern said there was an "overwhelming sense of hurt and shame that this has happened in our country". "On behalf of New Zealand, I want to apologise to Grace's family," she said. "Your daughter should have been safe here, and she wasn't, and I'm sorry for that." The body - which has not yet been formally identified but the police believe to be Miss Millane's - was found "about 10 metres" off Scenic Drive, a countryside road outside the city, Det Insp Scott Beard said. On Sunday, Declan Millane, one of Miss Millane's brothers, shared a collection of photographs of his sister online, alongside the lyrics to the chorus of the song You Are My Sunshine. 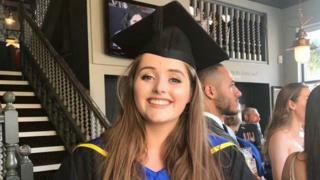 The University of Lincoln, from which Miss Millane graduated earlier this year, paid tribute and said its community was "deeply saddened". Floral tributes for the recent graduate have been growing outside the Willows Centre in her home town of Wickford. The announcement on Saturday by police that Miss Millane was "no longer alive" followed a review of CCTV footage, the forensic examination of a hotel where she was last seen, and the discovery of a vehicle. Police said her family were "devastated" after being told the missing persons case had become a murder investigation. Foreign Secretary Jeremy Hunt has added his condolences on Twitter, saying: "Grace Millane's murder was an unspeakable tragedy that has shaken us all." He also thanked the New Zealand prime minister "for standing shoulder to shoulder with the UK with such grace and dignity which speaks volumes for the deep friendship between our countries". 1 December, 19:00 local time: Miss Millane is seen on Victoria Street in the city centre of Auckland. A short while later - 15 minutes - she is seen on CCTV at Sky City, a complex of hotels, restaurants, bars and a casino. 1 December, 21:41: Later that evening, she is seen with a "male companion" at Citylife Hotel on Queen Street, which is just a few minutes' walk from Sky City. 2 December: Miss Millane's 22nd birthday. She is not in contact with her family. At just before midday, a red Toyota Corolla hatchback rental car is hired from a company in central Auckland. 3 December: The red car is believed to have been in the west Auckland area between 6:30 and 9:30, police say. 7 December: Miss Millane's father, David, lands in Auckland and makes a plea for information. Police say they have identified the male companion and have spoken to him. Later that day, police announce they are treating the disappearance as a murder investigation. Officers say the 26-year-old man is to be charged with Miss Millane's murder. 9 December: Police search an area of forest near Scenic Drive in the Waitakere Ranges beauty spot. Shortly after 16:00, police find a body which is believed to be Miss Millane. For many backpackers arriving in New Zealand, Auckland is the first stop on a carefree adventure around the country. But Grace Millane's murder has left some here feeling pensive and anxious, reminding them just how far they are from home. At the hostel where Grace had been staying, I talked to several travellers who spoke of their disbelief when they heard that she'd been murdered. One had shared a dorm with her, and had traded stories and advice on where to go and what to see. Another told me she remembered Grace's beaming smile and energy. All wanted to stress how deeply they felt for Grace's family after such a sudden, incomprehensible loss.